We has also negotiated via a third party to list many other popular hotels and this is presented as a listing with an idea of pricing. All these enquiries and bookings will be handled by our online travel information. Properties offering basic accommodation and limited facilities. Properties offering modest accommodation and limited facilities. They may not for example have restaurant or bar. Properties offering comfortable guest rooms and functional public areas. Many feature a coffee shop, restaurant and bar. Well maintained properties with superior first class facilities, services and amenities. Properties with tasteful decor, excellent service and quality facilities. 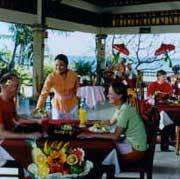 Most feature a restaurant, coffee shop, bar, public areas and leisure facilities. Deluxe properties offering luxury accommodation with high standards of service and facilities considered the best available in the country.